I welcome you all for this session of virtual tour on Kundrandarkoil. In this trip we go around the outer prakara of the cave temple. A huge compound wall in the periphery encloses the outer prakara. In the main entrance there are four massive pillars in the center encircled by a basement. The brick fence extends on both the sides for few yards and turns towards west. On the northern side it ends near the second prakara compound wall, whereas on the southern side it runs upto the south of Nirtamandapa and from there only scattered walls are seen. Another passage to the temple from the main road is seen here. The adhistana with massive pillars in the main entrance connotes the idea of a gopura. In the outer side to the right of the entrance is an idol of Ganesa placed inside a niche on the compound wall. As one enters the main entrance we can see the balipitha, dvajastamba and the nandi mandapa in the middle of the temple complex. 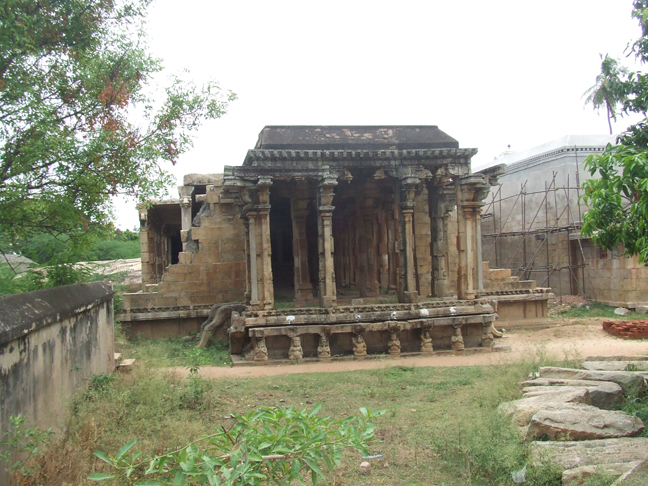 On the northern side of the outer prakara adjoining the nandi mandapa is the shrine for goddess Umayambigai facing south. 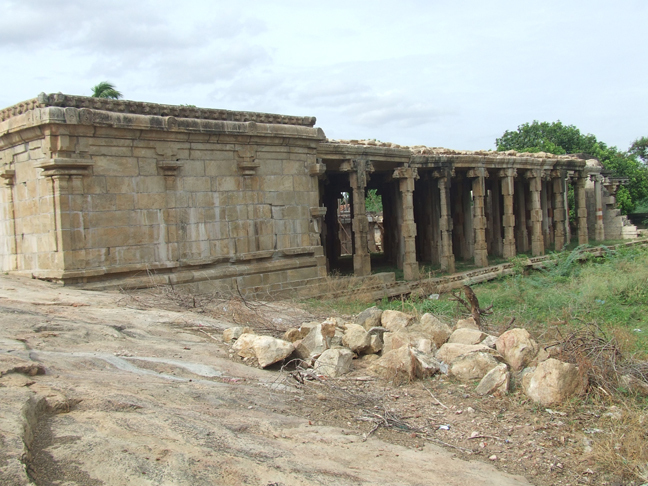 On the southern side of the outer prakara is the Nirtamandapa, a huge pillared hall facing east. To the northwest of the Parvathagirisvara temple above the hillock is a shrine for Lord Subramania. A remarkable feature of this cave temple complex is a pillared hall found on the southern side of the outer prakara lying in east west direction. The pillared hall known as the Nirtamandapa in inscriptions was constructed under the sponsorship of public - indiscrimination of status. It is a beautiful hall with interesting architectural features. The striking feature of this mandapa is its spaciousness. Not only the colonnade area is spacious even the theater is roomy for performing a play, dance or any civic or bureaucratic gatherings. The mandapa can be divided into three parts - a porch like projected frontage with steps on sides, the middle part a huge hall with rows of massive pillars and the rear part a pillared stage. A small platform is seen on the northwest corner of the theatre, which might be for the accompanying musicians. Another interesting thing to note is the opening on the northern side of the stage, which might be a private entrance for the artists. At present, the mandapa is in dilapidated condition with debris around it. The roof of the mandapa is totally ruined causing leakage of rainwater. The scaffoldings put up around the temple shows that renovation is undertaken, but all at a snail's pace. Thus the mandapa lost its prodigy and at the mouth of ruins. According to Dr. R.Kalaikkovan, it is the only spacious mandapa he had ever seen, which could be used even today for theatre shows. The front projected portion is shown as a chariot with horses and wheels each one on either side. The well decorated horses are towing the stage with their hind limbs resting on the floor and the fore limbs in rampant posture. The spokes of the wheels are decorated as human figures. On the eastern side, that is, in the front face of the mandapa bhuta ganas are shown bearing the stage on their head. The raised portion of the mandapa is shown as an additional basement with the components of upoupana, upana, padmavari, gala complex and projected vajana, kapota and bhumidesa. The vajana in the prativari forms the surface of the mandapa. The padas shown in the gala complex are adorned with scrolls. These basement features run through out the mandapa. 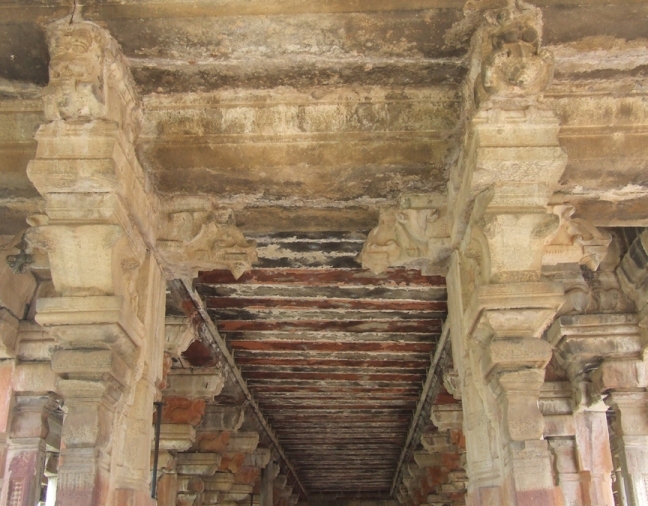 A flight of steps arranged on both sides in the porch forms way to reach the mandapa. On either side of the steps at the beginning projected makara heads with trunk flowing in wavy style are seen. The undulating trunk of the makaras forms the parapet wall with twirling end. On both sides on the parapet wall kumbapanjara is shown. Even the steps are given ornate finishing with kandapada and padmavari on the faces. There are eight ganas except one all are males. All the ganas are seated in their usual weird posture with their pot belly projected out. Bangles, armlets, anklets, partrakundalas, udarabanda, charapali are the ornaments found. From south to north the first four are with jatabara and the rest four towards north are with virisadai. All are wearing the head ornament called the patta. Of the eight second from the south is the only female gana and it is shown with the breast band and hands stretched on its sides. From south the first, third, fifth and the last one are blowing conch. The fourth and sixth are shown in dancing posture, while the seventh one is holding a small instrument in its hands. A flight of seven steps leads us to the mandapa porch. The porch has totally eight pillars - four in the frontage, two in the center and two in the rear portion. A wall enclosure adjoins the rear pillars, which extends on both sides. For refurbishing work the stone slabs of the sidewalls are removed. On the whole the pillars of nirtamandapa are massive and arty. In a single pillar two to three types of variations are shown. The faவூade pillars are very ornate and decorative. The pillars have the features of three squares and indrakattu between them with nagabandas sprouting on the corners of the lower square. Padmakattu is shown on either side of the Indrakattu and a patta in the middle. The central square is adorned with miniatures and circular or square medallions. On either side of this main pillar are shown the adjoining pillars. 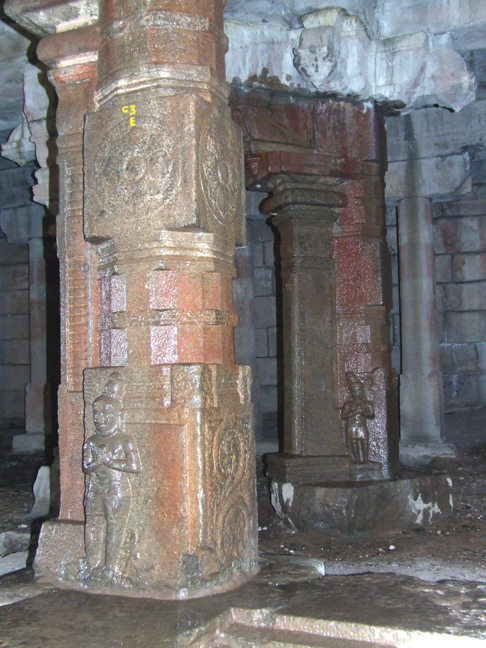 The adjoining pillars possess a base, in some pillars it is shown as a upapitha and in some pillars it is simply a square. Above the base raises the brahmakanta shaft with the usual upper parts. In the faவூade the two corner pillars possess three adjoining pillars. Through out the mandapa the corbels are massive and are madalai in style with the spout like extending nanudal on both sides with a sharp edged bud hanging in the tip. The corbels of the main pillars hold the uttira, whereas on the outer side the corbels above the adjoining pillars hold a supporting slab, which bears the beam connecting all pillars. Coming to the inner side the corbels of inner adjoining pillars hold a stone slab with seated lion on it. The roof of the porch is flat with two layers of stone slab arrangement. In the corners, on four sides a row of stone slab is arranged above the seated lion. The outer face of the stone slab is decorated with the roof components like uttira, vajana, valabhi and kapota with kudu arches. Above this layer of roof, stone slabs extend on north south direction to cover the canopy. Thus the pillars in porch support three different sections of the structure. The central part of the pillar holds the uttira that runs above all the pillars, the adjoining pillars shown on the outer side holds the belt like beam connecting all pillars and the adjoining portion in the inner side bears the roof. On the outer side valabhi is adorned with rows of madalais extending upwards joining the roof. Cement mortar covering is done for the outer side. 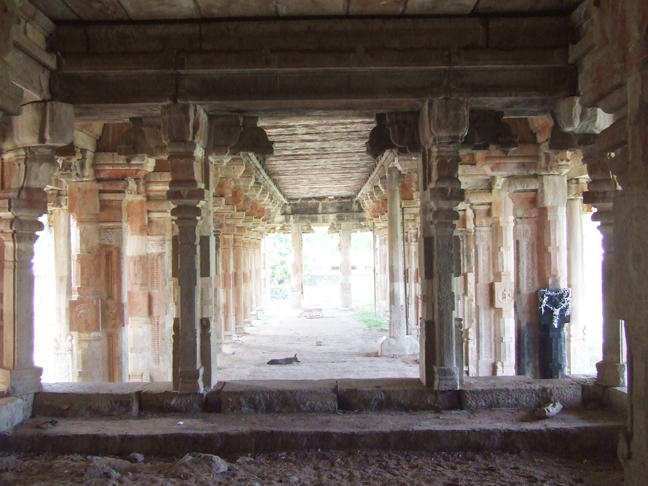 The middle portion of the mandapa consists of a pillared hall, a place for the spectators. The colonnade has six rows of massive pillars with three rows arranged on either side with a spacious pathway in the middle. The roof height of the audience hall is little higher than the porch. Except the corner rows of pillars the inner four rows possess ten pillars each. The corner rows on either side contain only seven pillars. The wall enclosure starting from the rear pillars of the porch extend towards west till the half way on both side and ends adjoining the seventh pillar. At present stone slabs of the wall is removed for overhauling. The audience hall has three varieties of pillars. 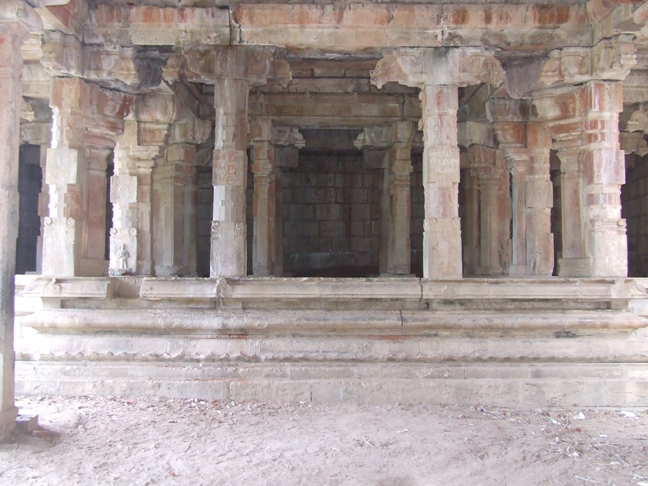 The corner row of pillars on either side possess single pillar with the same features of squares at corners and middle and indrakattu between the squares. The lower squares possess nagabanda at corners. On either side of the indrakattu is the padmakattu and in the center the patta. The middle squares possess the miniatures and medallions on its faces. The potikas above the pillars raises upward to bear the roof components. 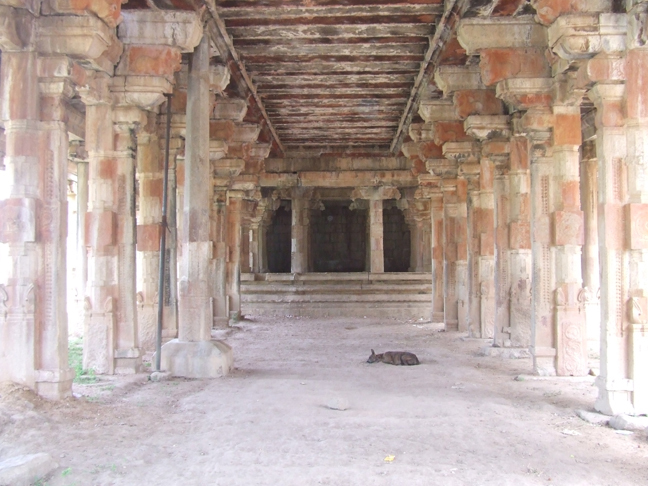 The canopy of the roof is encompassed with slabs in north south direction between the outer and middle row of pillars. Rudra type of pillars adorns the middle row on either side. 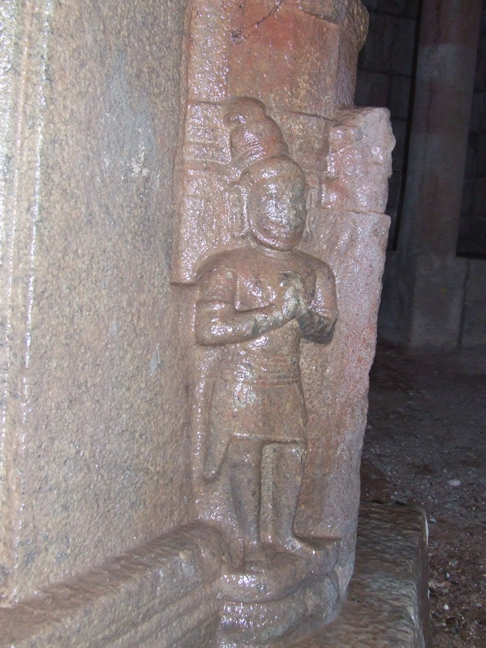 The rudra shaft rises on a square base with padmakattu and nagabanda on corners. The potikas are same as that in other pillars. Roof slabs are arranged between the middle and inner row of pillars. 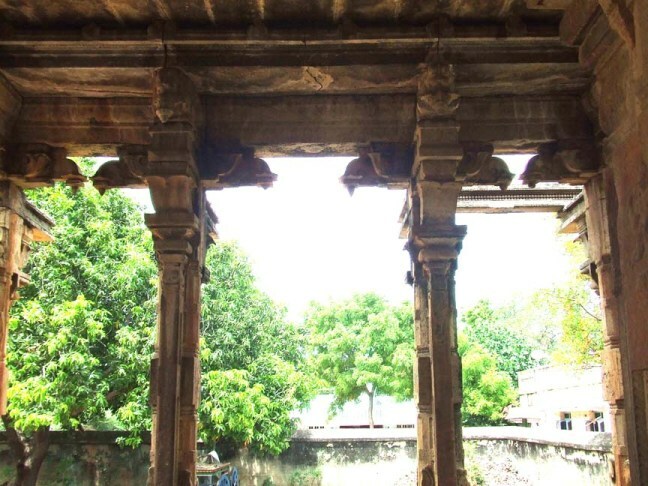 As like the porch the inner portion of mandapa is shown with ornate pillars and double layered roof. The roof height of the mandapa between the inner rows of pillars is increased and the pillars on either side of the path way are very ornate and decorative with complexity of features. Double pillars are shown, with the main pillars facing outside and the adjoining ornate pillars facing inside. This array gives a look of a darbar hall in a king's palace. In the porch two adjoining pillars adorns the main pillar, but for the mandapa a single adjoining pillar adorns the main pillar. The square bases also possess scrolls. The adjacent pillars have a base of upapitha and kapota with kuduarches roof. Above it starts the brahmakanta shaft with the usual upper parts. 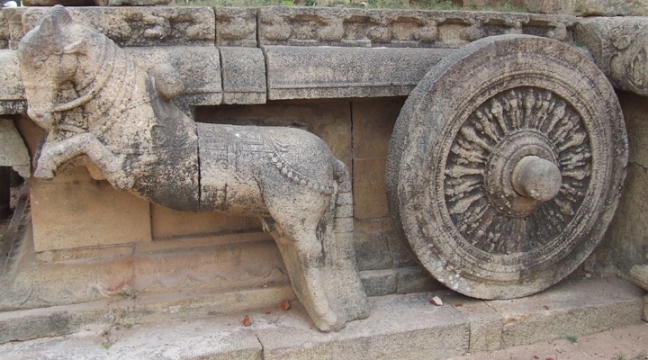 Instead of potika a seated lion bearing a stone slab is shown above the palakha. As like the porch the potikas above the main pillars bear the uttira vajana and valabhi connecting the other pillars in the row. The seated lion bears a massive stone slab on which three rows of roof slabs are arranged in east west direction. To enhance the beauty of the mandapa the outer face of the roof slab embellished as uttira, vajana, valabhi and kapota with kudu arches. Roof slabs are arranged in north south direction above the kapota of the inner roof to cover the center of the mandapa. 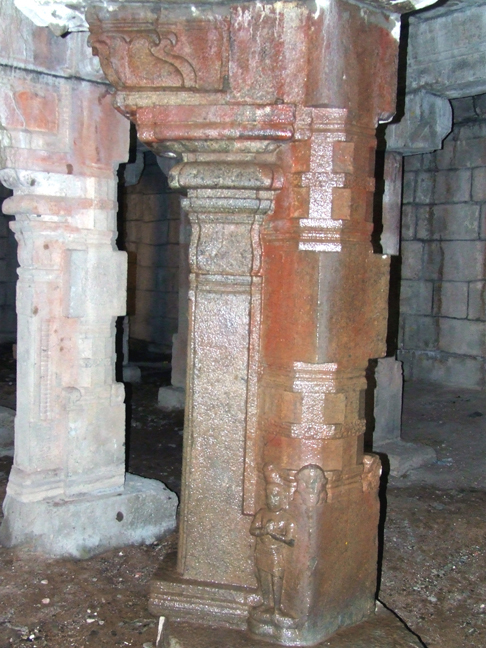 Minute architectural features are handled in the brahmakanta shaft of the adjacent pillars. A square is shown in the middle to part it as two sections. The ridges are decorated as padmavari with kattu and nagabanda on corners. On the side faces approximately to a height of one metre from the base a small louts flower with stalk is shown. Above it a rectangular shaped cavity bordered like lotus petals and the inner side carved as miniature pillars are shown. The same architectural feature extends to the upper shaft also. These miniature carvings are interesting thing to note. Coming to the rear part of the mandapa, which consists of the pillared stage with wall enclosure on north south and west. Entirely the stage is constructed on the sloppy edges of the hillock. On the southern side of the mandapa the hillock is at a good height whereas on the northern side it almost slopes to the earth. The upapitha, which forms the basement of the porch and the central hall, ends adjoining the mother rock on the west. Above the yazhivari of the supplementary basement raises the stage with its own adhistana. The basement is seen on the sides and in the frontage whereas in the posterior the mother rock covers half of the wall. The adhistana of the basement is of padabandha in type and begins with the upoupana. Above the basement raises the wall adorned by pilasters. The brahmakanta pilasters are decked with the usual upper parts. 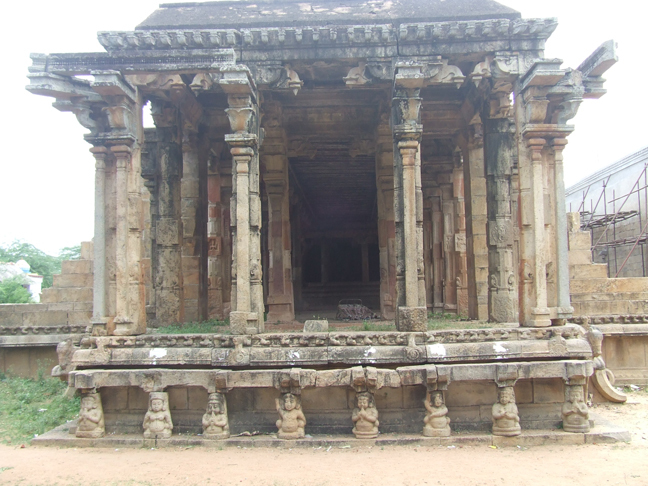 The potikas that rests on the pilasters are vettu with taranga in style. The potikas bear the usual roof parts, which ends with kapota with kudu arches. The kudus are unfinished. In the corners the kapota kudus are shown as alpa nasikas. Above the kapota is shown the bhumidesa. Coming to the inner side of the mandapa the upoupana, which is the lowest basement component of the sidewalls, extend inside the mandapa as a raised platform. Above the platform the stage is constructed. The facade of the stage has a box shaped projection in the center. Vargabeda is shown on the of the frontage for the raised portion. In the faவூade as for the sides the basement is of padabandha type with octagonal kumudha. 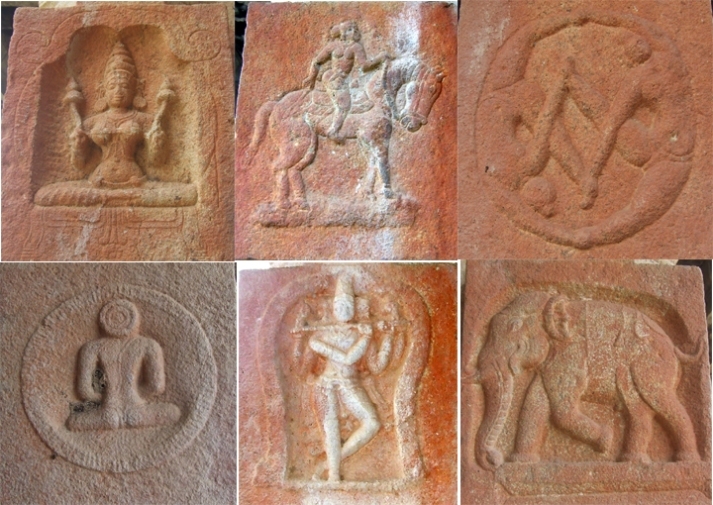 Whereas for the projected portion is padmabanda adhistana with the components of upoupana, upana, padmajagati with padmavari in the upper limit, rudra kumudha with padmavari on either side, gala complex and kapota with kudu arches and upari kambu. The upper surface of the upari kambu forms the floor of the stage. The kuduarches are rough and unfinished. Flight of five steps are arranged on either side of the inclined faவூade leads us to the stage. The stage has four rows of pillars totally constituting twenty in number. Apart from that, on either side on the extended portion of upoupana two pairs of pillars are seen. The pillars in the stage are short and massive with the usual architectural features as shown in the hall and porch. 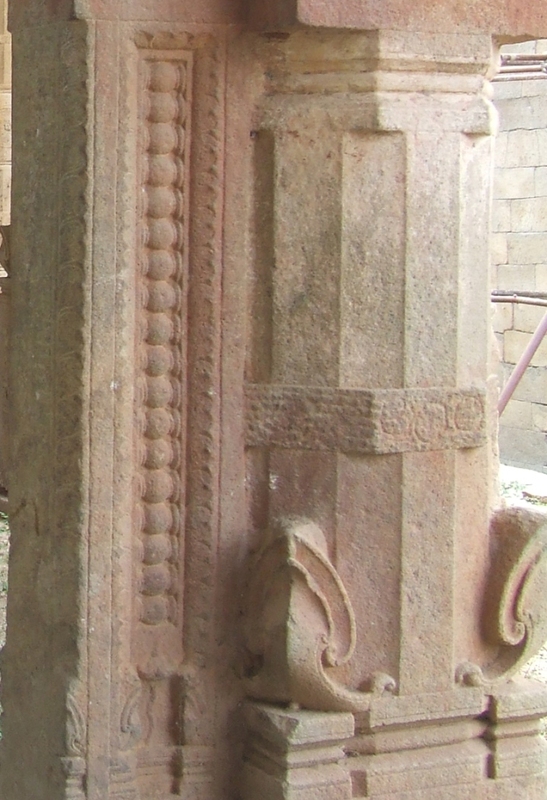 The hind rows of pillars are simple with square base and rudra shaft. The arrangement of pillars in the core area is the striking feature of the theater. The pillars covering the focus area are the ornate double pillars. It is arranged in a showy way as the main pillars facing outside and adjoining ornate portion facing inside. In the second row, the middle two pillars are omitted to create spaciousness. This highlighted their expertise and dexterity in the field of architecture even in archaic materials. The remaining pillars are single with the usual features. The roof finishing of the stage is as like that of the porch. To the north of the stage on the sloppy edges both rock cut and arranged steps are seen. These steps are used for both climbing the hillock and to reach the stage on the northern side opening. Another interesting feature to note about this Nirtamandapa is its construction through the sponsorship of variety of people. There is no discrimination of status or any other kind on endowment. Both a landlord and a common man of the village sponsored for the pillars. An inscription speaks that a native of Vadatholuvur in Thenvayur constructed the Povataraiyan Mandapa and the Nirtamandapa. If a pillar is donated it carries the name of the endower and in some cases even the figure of the sponsor. An inscription in a pillar speaks that a washer man called Sangathaarulan of Poochikudi and his wife endowed for it. Another sponsor was a merchant of Perumbuliyur. 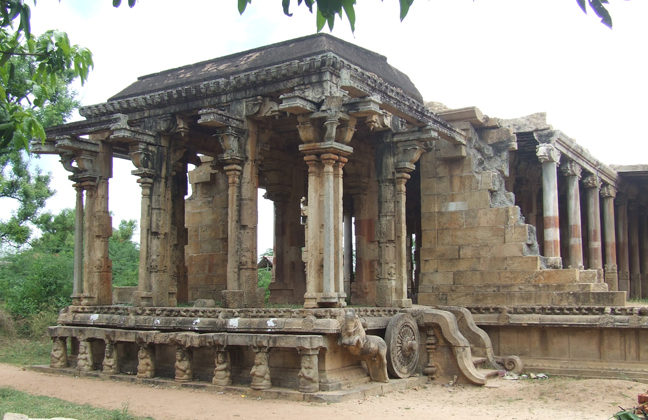 The araiyars of Tuvarankottai, Perumbuliyur, Teriyur, Nallur, Tuvarankottai also endowed each one a pillar. Even a lady called Udaiyar nachchi, daughter of Periyapillai also made contribution for a pillar. Even now this kind of construction under sponsorship happen but the publicity goes only to the person of high status. I stand in the center of the stage, it was amazing; the entire view of the hall upto the porch was spectacular, I realized the massiveness of the structure. Modern day qualified engineers do construct the building after pre planned sketch and layout, even aided by CAD and CAM. But I wonder from which university the architects of Nirtamandapa were qualified? In which CAD center they have worked such an architectural marvel? Absurdity only remains in my mind. The Nirtamandapa reveals our ancestors' proficiency and expertise in theatre art. It picturize how our ancestors have enjoyed their fine arts in lavish and extravagant manner. They not only enjoyed but also developed our classical form of arts, dance, music, drama etc. "KALAI VALARTHA KOVILGAL" What an apt title given by our Dr. R.Kalaikkovan to our temples. Dear readers I hope you have enjoyed the trip, bye for now, in the next trip we go to the shrine of the Goddess Umayambigai and Subramanya.